Congratulations! You’re ready to take the next step and deepen your panel moderation skills. 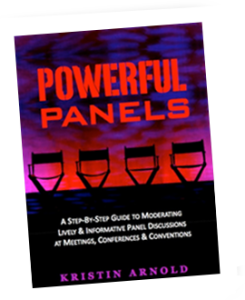 You can buy the guidebook, Powerful Panels: A Step-By-Step Guide to Moderating a Lively & Informative Panel Discussion at Meetings, Conferences and Conventions. 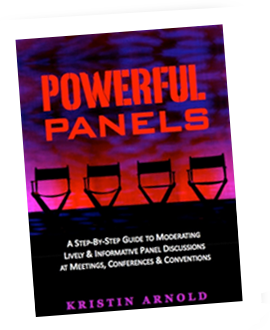 Drawn from her extensive experience as a nationally recognized speaker, master facilitator and panel moderator, Kristin Arnold provides a step-by-step approach to help you moderate a lively and informative panel discussion. How to prepare to moderate the panel – including how to research the topic, the panelists and the audience, write the welcome, curate the questions you will ask, decide the audience Q&A format, determine the logistics, assemble the slideshow and promote the session. How to moderate the panel, including things to do just before the session starts, how to open the session, get the conversation started, keep the conversation moving briskly, intervene firmly and respectfully. How to follow up once the session is over! You can access the Powerful Panels Knowledge Vault. 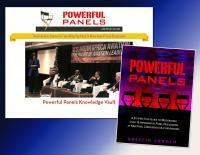 The Powerful Panels Knowledge Vault is a compilation of best practices of some of the most successful panel moderators. 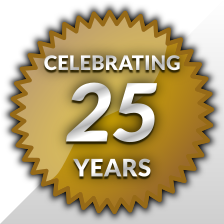 This virtual vault is chock-full of customizable checklists, worksheets, templates, agendas, sample emails, video interviews and webinars with industry icons and professional moderators, industry reports on the effectiveness of panels…and more! It’s a one-stop-shop – one place to find anything you need to know about moderating panels. Video and audio interviews and webinars with expert moderators, savvy meeting producers and meeting industry icons. PLUS! This collection includes the Powerful Panels eGuideBook. with these amazing, comprehensive resources today!